I'm please to announce that our oldest grandson is graduating from high school on June 10th. It seems like just yesterday that he was a little tot toddling around the house. We have loved watching him grow up and we have followed with enthusiasm as his interest in robotics has developed. He will be going to college this fall. Way to go Alex. 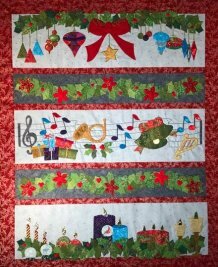 I have all of the applique for Ann's Lyrical Christmas done. The last row is pictured above. It has been a challenge for me but then it is good for all of us to "stre-t-c-h" ourselves. The final row of candles and snow globes will be published in October. That gives you three month's to stitch the lyrical row which will be published in July. Jerry and I have decided to visit our New England states in the fall of 2018. Twenty-two years ago we made it as close as up-state New York. This time we hope to visit all of these historical states. We will be traveling between 8/15/18 and 10/13/18. 10/13/18 - Tentative: Workshop As you can see through the list to the left, we are well on our way to having our trip to New England full. Those clubs listed as "tentative" have received but not returned a signed contract. At the moment I'm reserving the times for them. Those without the word "tentative" in front of their listing have returned a signed contract to me. We still have openings for three weeks - the last two weeks of August and the week of 9/17/18. If you are interested in having a trunk show and a workshop, please contact me. See "New England Here We Come" directly above this to learn how to contact me. My apologies to the reader that requested a way of purchasing just the patterns that come with my DVD's. I'm afraid I lost your e-mail. Probably deleted it in a fit-of-housekeeping. Both patterns are now available. 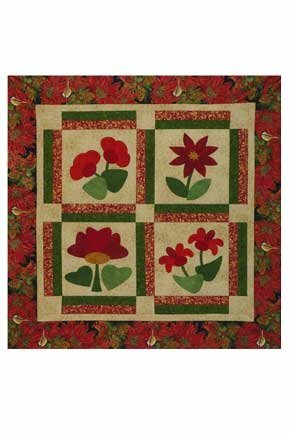 Click here for "The Beginner's Sampler". Click here for "Colors of Autumn". July's issue of this newsletter is promising to be a big one. Just to whet your appetite I've made a list of a few of the topics that will be coming your way. - "Ruth's Radiantly Rad Roses" - a new strippy pattern. Check the photo to the right. 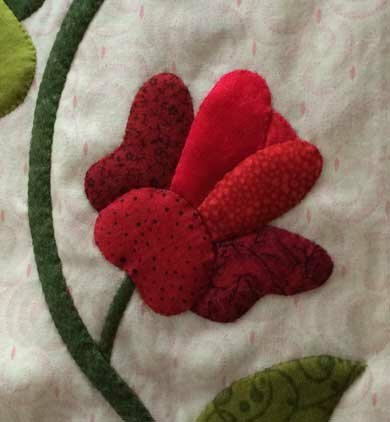 It is a sneak peak at the roses in this quilt. They have been heavily sculpted with batting. 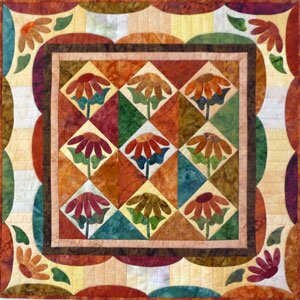 I love this pattern and think you will too. - The lyrical row of "Ann's Lyrical Christmas" will be published. You can see this row below. It was so much fun stitching this row. It went much faster than I ever dreamed. - I have simplified the way I do "circles". I'll publish a very brief tutorial of this in July. - In the tips section, I'll tell you more about making beautiful roses such as the one to the right. - I'll also begin giving you hints about my next free BOM which will start in January. You won't want to miss this one. It's called "Connie Sue's Sketchbook". 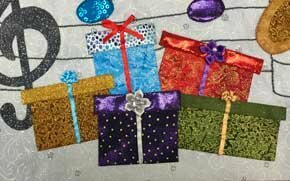 Here is a close up of the packages after I added the ribbon bows. More about that next month. Yes I've completed the top. (right) It is ready to quilt. I'm not sure exactly how I will do that. Any suggestions?